Styles come and styles go, but cool remains constant. It is — appropriately enough — universal. Cool was born in that brief transition between “keen” in the 50s and “far out” in the 60s. Cool is Sean Connery, sitting poolside casually nursing a cocktail. Cool is the glint of sun off chrome. Cool is beach blanket bingo, with the young American male discovering the wonders of the bikini. Cool is feet propped out the windows of a woody with a longboard on the roof and the Beach Boys on the radio. As tastes changed and “far out” gave way in its turn to “rad” and “dope” in the ensuing decades, this brightly colored atomic-age cool remained, passing from novelty to kitsch and finally returning to its rightful place as the vanguard visual style of America’s tastemakers. Cool is back, and it calls Cabana Cay Beach Resort home. Cabana Bay’s throwback aesthetic has brought cool back in a big way, elevating the neon-hued color palette and meandering wavy patterns of the late ’50s and early ’60s beyond their throwback roots and giving them new and modern life. These days, cool lives in the sparkle of the neon sign greeting visitors, the multi-tiered tower dominating the pool, the vintage swizzle sticks in The Swizzle Lounge. Cool lives; and it brought the classic family drive-up vacation with it. Dagon was central to the distinctive vintage look of the property (he cautions against the use of the word “retro,” saying, “We use the world retro a lot, but I was corrected by one of our graphics people that it’s vintage. It’s not retro, it’s vintage.”) but he had a lot of help in creating the multi-layered environment at Cabana Bay. The way this visual language has been captured at Cabana Bay is everywhere, and it’s nowhere. You walk through the lobby and you’ll hear the Beach Boys, the Platters and every other manner of oldies tunes. But head to the pool, and doo-wop blends effortlessly into a blend of today’s poolside hits. Feel the crisp rush of air conditioning as you enter a room and you’ll be greeted by a dazzlingly period-appropriate color scheme, a wide surfboard-inspired counter that sweeps past the Japanese-style sliding wall and back to the beds, where a genuine ’50s alarm clock awaits. And of course you’ll see that Zest and Alberto V05 waiting in the shower. But you’ll also see high-def TVs, USB chargers and all the modern amenities of very “now” hotel. The result of this dedication to time travel is a hotel that recaptures that classic era of the drive-up family vacation, from the vintage family trucksters parked out front to the groovy piles of pillboxes and footlockers in the lobby. It doesn’t feel like a 1960s hotel, it feels like what a 1960s hotel felt like to that family pulling up in the family station wagon. Every detail, from the way the colors pop at the Atomic Tonic poolside lounge to the collection of 1950s bowling trophies at the on-site bowling alley Galaxy Bowl evokes a time and place where cool never dies. 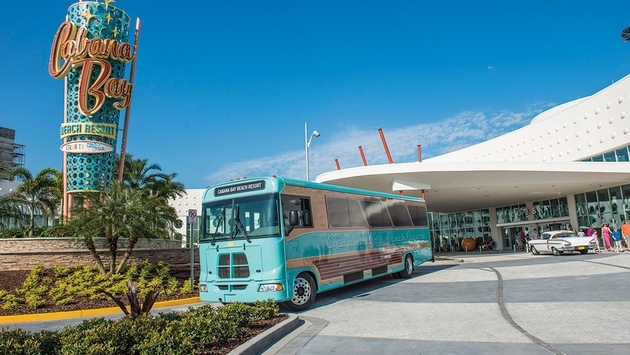 It’s a pedigree that Cabana Bay, a Loews Hotels property, comes by naturally. Each of its buildings evoke a historic hotel — Thunderbird, Starlight, Castaway, Continental and Americana — but it is this last one that holds a special place in the property’s DNA. Indeed, the palm trees central to the main lobby that greet visitors are the spitting image of the iconic Morris Lapidus-designed terrarium that anchored the original Americana in Bal Harbour Florida. It’s just one of the many details leave guests in a wonderful sort of time warp. The on-site fitness center carries the Jack LaLanne name, and its walls carry scores of photos, plaques and mementos from the king of 1950s fitness. Video screens roll through vintage advertisements at the Bayliner Diner. It’s everywhere, and yet somehow the theme never seems forced or inauthentic. There is no shortage of nostalgia, but more than that, Cabana Bay harkens back to the golden age of the family vacation, puts a masterful modern spin on it, and in the process has created an old-meets-new destination unlike anywhere else. READ ON: You know what else is cool? Getting into The Wizarding World of Harry Potter an hour before everyone else. Your one free twist of the time-turner comes with a stay at Cabana Bay, and it's crucial to Enjoying Universal Orlando Like a Pro.